Former superhero Jack Shepard, (also known as Captain Zoom), is called back to work to transform an unlikely group of ragtag kids into a new generation of superheroes at a privacy Academy and save the world from certain destruction. The project holds an audition of would-be members, most of whom possess useless or disgusting powers. In the end, Dylan, a 17-year-old boy who can turn invisible Summer, a 16-year-old girl with telekinetic powers Tucker, a 12-year-old boy with the power to enlarge any part of his body Cindy, a 6-year-old girl with super strength. In the only photo of the old Zenith team, in addition to Tim Allen (Zoom) and Kevin Zegers (Concussion), the other teammates are portrayed by Alexis Bledel (Ace? ), Wilmer Valderrama (Marksman?) and Devon Aoki (Daravia?). Continuity: When Cindy shows the Approval Team her powers, she throws the desk where Jack is looking at the applications. None of the folders move. When they ask for a new desk, the folders are back. Dr. Grant: Let me put it this way. Concussion is still alive, and he's coming back. Larraby: We were there. We both saw it. I rented this movie for my cousin, it was his pick and we watched it as soon as we got home, he loved it! I seriously was expecting this big travesty of a film with the way the users are talking about it on IMDb, but I have to honestly say that it wasn't THAT bad, come on, it's a kid's movie, what did you expect? Citizen Kane? For the kids it had a fun plot and cool visuals, yeah, the story was a little lame, but as adults we should know that this movie was not meant for us, so I am going to judge it on being a children's movie. 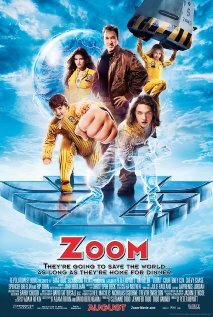 These kids all have super powers, but don't know how to use them effectively, so the program of Zoom is going to help them become super heroes with a man who was a former celebrity type of hero who is now a has-been. They enjoy being kids with each other and learn how to use their powers in the right ways and must destroy Conor, another former super hero who went bad. Together they all must learn to a team and also a family. Like I said, for a kid's movie, it's cute and it really wasn't a BAD movie, I've seen worse, believe me! So don't use most of these comments as your judgment factor, see how the kids react and really judge for yourself, it's a fun little flick that I wouldn't watch again, but I think it will be a fun small classic somewhere down the road for the children.